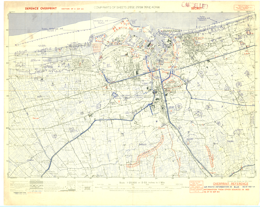 This is a 1:25,000 scale composite map (defence overprint) of Dunkerque, France, published on September 11, 1944. It is a composite of several sheets (28 SE, 29 SW, 39 NE, 40 NW) published by the Geographical Section, General Staff (GSGS) of the War Office of Great Britain. This overprint was referenced from air photographs taken September 1, 1944, and other sources September 10, 1944. Production information for the base map is 2M/9/44/3RCE/5162. Production information for the overprint is 610/9/44/3RCE/5162.